Tom Stewart (inertly played by Richard Carlson of Creature From The Black Lagoon) tells his girlfriend Vi that he is breaking up with her and is instead going to marry his other sweetheart Meg, mainly because she’s prettier and her daddy is stinking rich. Vi pulls the old “well I guess I’ll just have to publish my little book I’ve been working on called Tom Stewart’s Love Letters to His Skanky Hooch Vi.” She also threatens Tom with giving the letters to her lawyer for a lawsuit. I guess if she’s alleging that he’s a stud jazz pianist, then he’s guilty as hell! Tom’s not too keen on having his studliness put on trial though and in a plot twist only Vi didn’t see coming, her ample caboose breaks through the railing at the top of the lighthouse. 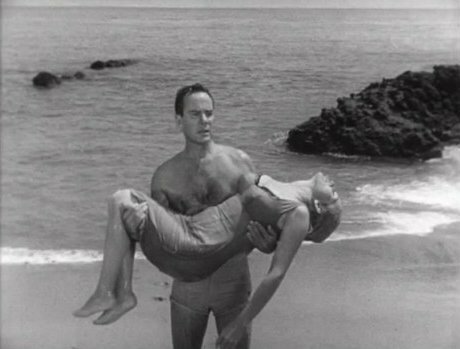 She hangs there above the rocky surf with one hand, pleading with Tom to help her. While Tom stands around no doubt pondering how heavily discounted Vi’s book about him will be on Amazon, Vi falls to her death. Tom realizes all this and dives in and hauls the body to shore only to discover that it was just a bunch of seaweed and that his walnut-sized brain was playing tricks on him! About this time we meet Sandy. She’s Tom’s fiancee’s eight-year old daughter and is played by the daughter of the director. She’s not as bad as you would expect the daughter of the director to be, but I’m supposed to be seeing some dang she-ghost terrorizing this bum all over Haunted Island! Most of the movie Sandy just kind of hangs around getting on the increasingly insane Tom’s nerves, but how many of us could really put up with some dumb kid trying to show us some lame magic trick, while we keep hearing our name being called by our dead girlfriend? Tom sits around his island bungalow trying to practice his piano playing, but stuff keeps happening to interrupt him. Stuff like some record being mysteriously played, even after he’s taken the record off of the record player. I imagine it’s just a coincidence that the record is that kicking new tune called “Tormented” by that break-out artist, Vi! For no real reason, we’re introduced to the blind real estate agent who doesn’t seem to do anything on the island but bring people flowers. She tells Tom that even though she really doesn’t believe in she-ghosts and stuff like that, she sees a lot of strange things in her business. Then she tells some vaguely supernatural tale about a boy and his dog that turned into ghosts and left seaweed laying around the house and peed on people’s couches or something. She leaves and Tom gets haunted some more. Tom tries to get Meg to elope so he can get off the island, but she says no, so he says he just might go elope by himself. I know that as you’re reading this, you’re wondering how much more exciting can things get. How does a boat captain who ferried Vi over to the island (she even managed to mention the name of her secret boyfriend to him) and is owed five bucks by her sound? Tom is new to this whole “covering up suspicious disappearance of mistress” thing, so when the sea captain comes by looking for Vi because she owes him five bucks, Tom grudgingly pays him and thinks that’s that. Naturally, the sea captain puts together the fact that no one ever saw Vi leave the island and that Tom is getting hitched to some rich gal who isn’t Vi and he realizes that the five bucks he got can be re-negotiated into $5000! The sea captain gets cool points because he constantly refers to Tom as “Dad” but Tom gets cool points because he takes the sea captain up to the lighthouse and is convinced by the she-ghost to whack him in the head with a lead pipe. After he leaves with the body, Sandy comes walking down the stairs all sad and stuff. Tom went and murdered a guy and didn’t even tell her! And she thought they were best friends! 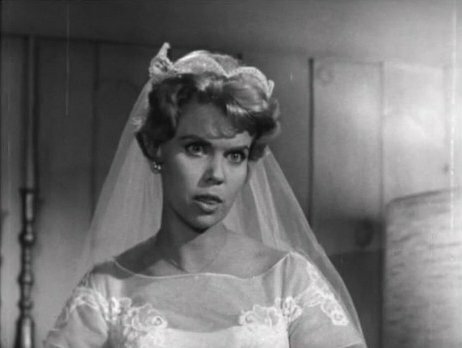 If you’ve been thinking that up until now, the she-ghost hasn’t exactly been pulling out all the stops in terrorizing Tom then you’ve got to see her when she causes Meg’s wedding dress to be ruined because there’s seaweed on it! Director Bert I. Gordon (Empire of the Ants) shoots this in about the most bland way you can imagine, using the same ugly establishing shot of a beach house about ten times during the movie. Sometimes it looks like night, sometimes it looks like sunset and sometimes it looks like it was cloudy, but Gordon was hoping it would pass for night – all in the same scene! 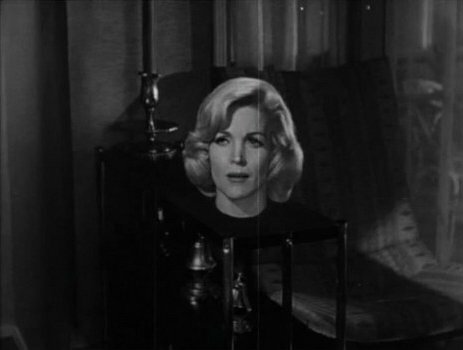 And the effects used to depict the hauntings make you long for William Castle’s tricks, especially when Richard Carlson is forced to hold a mannequin’s head and act scared of it. For his part, Tom is an unsympathetic moron, and the movie can’t even decide if the she-ghost was just a product of his imagination or not since everyone saw her handiwork at the wedding. But if it wasn’t his imagination, then he really wasn’t driven insane by his guilty conscience, which renders the whole concept (or at least what I thought was the concept) of the movie void. 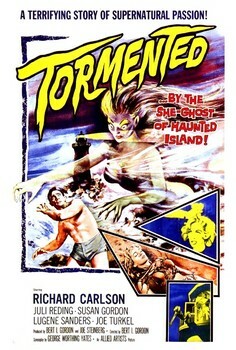 Tormented is an apt title for this film, but for all the wrong reasons. It’s an experience about as welcome as wilted flowers, obnoxious wind, and a wad of stinky seaweed at your wedding!